This newly remodeled Cabin O’Pines Resort cabin on Pelican Lake is perfect for family gatherings, and everyone in your family will agree that the living quarters & furnished kitchen feels like home-away-from-home. You will love the warm feel of this cabin. Enjoy the quiet beauty of the woods and the 450′ fishing pier (the heart of the resort!) Bass, walleye, northern and crappie are numerous for serious anglers, and non-stop panfish action is fun for the kids. If you need a few supplies or a souvenir, you’ll find them at the resort Gift Shop. Spacious inside and outside. A very spacious living/dining room (two full size living room couches) plus a brand new deck, and fire pit with ample seating for your large group. Fire up the barbecue grill - gather around the fire ring area at night for S’mores. Guests have been known to lounge at the Cabin O’Pines Resort all day long. Here are a several surprises! We have a wood stove sauna, fish cleaning house & freezer service, power pedestals on main dock, live bait (leeches, nightcrawlers, crappie minnows), boat ramp, free pedal bikes (1 tandem bike), 4 Kayaks, 4 Pelican Paddle Boards, 2 Paddle Boats, 1 Canoe. We are Solar Powered! Relaxing on the patio and watch the resort & lake activities. Or participate with new resort friends: Play tetherball, basketball or horseshoes (Split Rock Cabin is next to the basketball court). Walk to the sandy beach/large swimming area and soak in the sun. Kids love the Kids Zip Line, stainless water slide, swim raft & kayaks, 450′ fishing pier (a great place to fish and watch wesome Sunsets), 12-activity playground. 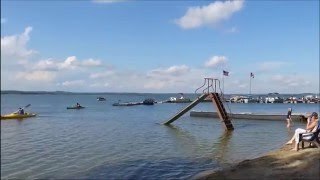 A great fishing trip or family vacation is waiting at Pelican Lake in Orr, MN. 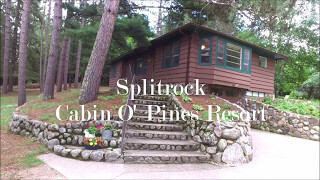 You might want to explore the area too - good thing you book directly with our friendly team at the Cabin O’Pines Resort. Inquire about out fishing packages or let us know where you’d like to explore. Being as far North as Orr, MN has lots of advantages: Birding Northern Minnesota & Pelican Lake Wildlife; see wild black bears at the Vince Shute Wildlife Sanctuary; do some lake hopping and see Crane, Echo, Vermilion and Elephant Lakes. 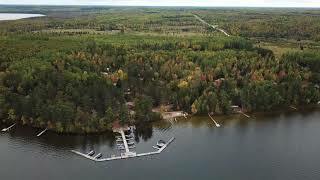 The area is also home to Minnesota’s only national park, Voyageurs National Park, which is a water-based park for boaters, paddlers, snowmobilers, and nature enthusiasts.